Finally, you can now unlock your iPhone without going through so many technical steps! 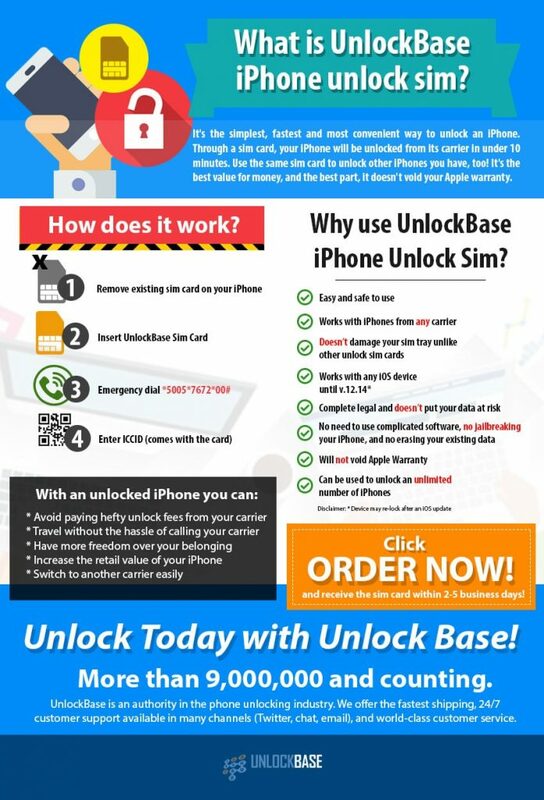 UnlockBase now offers the iPhone Unlock Sim, a product that uses a sim card to unlock your iPhone from your carrier. Simply insert the special UnlockBase sim card and enter the correct ICCID code that comes with it. No rooting, no software to install, no erasing anything, and no voided warranty. Get your phone unlocked in under 10 minutes without even sweating it! Take note, your iPhone may lock itself again with your carrier if you do a factory reset/hard reset or an iOS update on your device. But the good news is, you can use just ONE sim card to unlock your other iPhones! You can unlock as many iPhones as you want with just one sim! No need to pay for an unlocking fee for each of your devices, just imagine how much you and your family and friends could save! How To Use The UnlockBase iPhone Unlock Sim? The process is simple and straightforward. All you need are 3 things: (1) iPhone Unlock Sim from UnlockBase, (2) your iPhone, and the (3) sim card tray ejector pin. On your iPhone, disable the mobile data. Remove sim card from the carrier. Pop the sim card tray using a pin and remove your carrier sim card. Insert UnlockBase iPhone Unlock Sim. Go to Settings > General > About and copy the ICCID (simply long press and tap ‘Copy’). It is also written on the card but to make things easier, just long press and copy the ICCID on your phone. When prompted for ‘ICCID code’ enter the code. Click Send. You will see ‘Done’ on your screen.Your phone is now unlocked! Please restart your iPhone to refresh the settings. Remove UnlockBase sim card and insert the sim card you want from another carrier. Restart your iPhone to let it refresh. We recommend that you reset the network settings. To do this go to Settings > General > Reset > Reset Network Settings. If you made mistakes during the process you can start over by inserting a different sim card. Why use UnlockBase iPhone Unlock Sim? It’s easy, safe to use, and convenient. No rooting, no complicated unlock software to use, and won’t void your iPhone’s warranty. It’s straightforward. Simply pop the sim card in, enter the ICCID code and you’re done! It works with all iOS versions. It works work on any iOS Device till v12.1.4 as of 21st March 2019. Can it unlock an iPhone 4s? YES! It works with any carrier. It’s compatible with any iPhone from carriers across the USA, Europe, Canada, and everywhere in the world. It doesn’t damage your sim tray. Unlike other unlock sim cards which have to stick to your carrier sim card for it to work (meaning you’ll have to stack the 2 sim cards), there’s no need for the iPhone Unlock sim card to stay inside your phone. You can remove the iPhone unlock sim card once you’re done and replace it with any carrier sim card you want to use anywhere you are in the globe. It is reusable. You can use the same sim card to unlock other iPhones, meaning you can unlock an unlimited number of iPhones with just one sim card! It’s legal and doesn’t put your data at risk. The unlock process is legal and won’t wipe your iPhone’s existing data. No need to back up your files or create a new Apple ID. We ship your sim card fast. We ship from California and it’ll arrive at your doorsteps in 2 to 5 days anywhere in the US! Ready to unlock using the iPhone Unlock Sim card? Click here to order! It’s totally ideal for short trips abroad or if you just want to switch carriers without canceling the rest of your family’s postpaid accounts (if you’re the principal account owner). Get your iPhone unlocked with UnlockBase. UnlockBase has been a trusted provider and a leading innovator in the phone unlock industry. When you purchase our iPhone Unlock Sim you can rest assured that you’re getting original products from our credible partners and suppliers across the globe. We offer an outstanding customer service reachable on many channels: email, Twitter, and through chat support. We’re 24/7 ready to answer your questions. Got questions? Let’s continue our discussion on the comment section below!